Ironically, your sales people may be negotiating with buyers who have been trained in negotiating strategies. Have you trained your sales people to be on a level playing field with their prospects? Who names his price first, loses. Who makes the biggest demand, wins. Who makes the biggest concession loses. ambro.com can train your sales people to understand and use these simple principles and give them real-world tactics that help close business with winning negotiations. 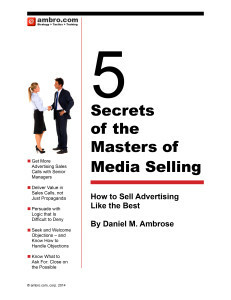 A media-specific negotiating tactic, that is important in advertising space or time or Internet media negotiations, is to negotiate up, not down: If you have a rate card, or a stated rate, and the customer says it is too high, your sales people’s first instinct should be to handle it as an objection. (See objection handling strategies here.) The second instinct should be to negotiate up, not down. We mean preserving the dollar amount of your proposal, during the negotiating process, while adding value to make it a better deal for the advertiser. Frequently media companies can add value to an advertising package that has significant and measureable value to the prospect, but costs the media company zero or next to nothing. Many very good sales people are very bad negotiators. Because sales people are gregarious and want to please the client, they have a tendency to say ‘yes’ too easily. But giving them a modicum of negotiating training will level the playing field for them. And every penny of the added revenue — after their commission — will drop to your bottom line when you get more revenue from essentially the same services. In short, small differences in negotiating outcomes can make a relatively big difference in your bottom line.